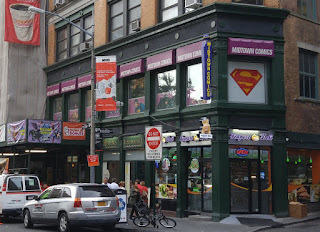 When I'm travelling, I like to check out comic shops wherever I am. Mostly to see how different stores respond to different local sensibilities, as well as what they do the same/different from other stores more generally. 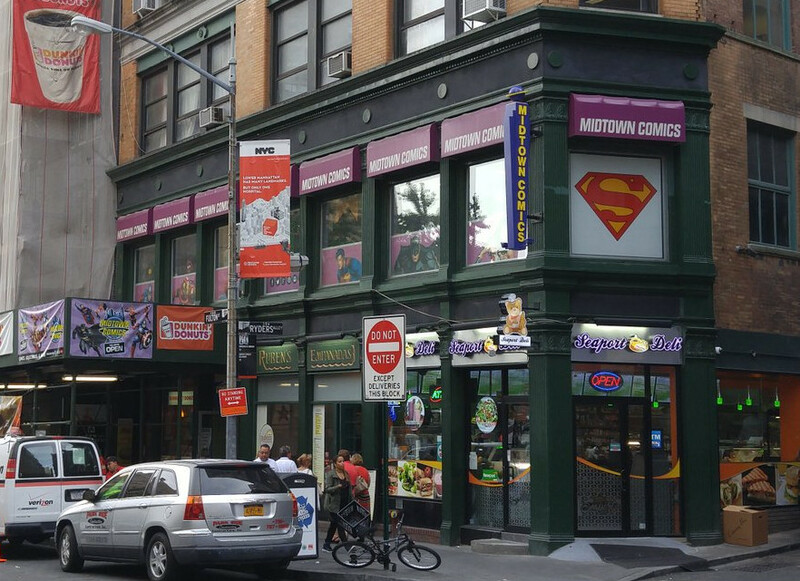 Since I happened to be passing through Manhattan briefly last week, I took an hour or so to swing by Midtown Comics' downtown location on Fulton Street. Even though I'd heard good things about the store, I was a little concerned when I first walked in. There was some '80s hard rock playing through, and it reminded me of every bad comic book store stereotype. The stairs open into the middle of the store and I turned left to see t-shirts, tumblers, stacks of Funko Pop vinyls, and all the stuff that sort of circulates around comics but isn't. As I began to look around, though, my mind got more at ease. As it happened, I basically walked through the store backwards. Studies have shown most people have a tendency, when entering a store or open area, to veer to the right. Had I done that, I would have come face to face with the racks of new comics. Followed by A-Z shelves of trades, hardcovers, and manga. Followed by A-Z long boxes of back issues before eventually getting to those t-shirts and tumblers. But, as far as the -isms angle is concerned, by the time I got walking around a bit, I noticed the four employees there. (It was a Wednesday, so I expect that number is a bit higher than normal. Fortunately, though, I hit the store after the lunch rush crowd, but before the stopping-by-on-the-way-home-from-work people.) Three of the four employees were women and one of them was a woman of color. I overheard one discussing the Top 300 list, expressing concern in the lack of titles in the higher numbers that weren't Marvel, DC, or a licensed property, and comparing that against their own store sales. Another woman was also quick to find a somewhat obscure book I asked about. So they clearly knew their stuff. A I said, the store wasn't crowded, but the customers that were there all seemed to be male. And while the store did have a surprisingly wide breadth of stock, it still seemed to favor the 'traditional' male-dominated superhero genre with the new issue racks broken out by publisher (Marvel, DC, Image, and Other). So a primarily male customer base makes sense. It was a good store, ultimately. As I said, they seemed to have a good range of material for fans of all types, even if capes were a little more prominent than, say, Raina Telgemeier or Jeff Smith. It seemed like they were trying to find a balance between those middle-aged fanboys who grew up with dungeon-like boys' club comic shops of the '80s, and a newer, more diverse fanbase. Whether they're successful in that or not, I suppose, boils down to how well the business does, and as this is their third store, I have to assume they're doing something right! On Strips: Go to Kenosha!